This Signature Football is a metallic finish size 5 ball. It is made in silver colour with stitched panel design. It features club players printed signatures and club crest across its surface. 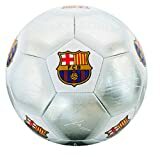 This ball is made of PVC (synthetic) and will make a fantastic gift for any fan. This football will be ideal for playing in the garden, for a kickabout at the park or to train your football skills on the pitch. This ball is not inflated for ease of posting, need to inflate it with a pump (not provided). This ball is an official licensed product.